The after-school elective design was the first design implemented back in 2004 at Center High School in Antelope, California, just north of Sacramento. A competitive application process targets highly motivated and responsible students but de-emphasizes their grades as long as it is above a “C”. The Center High School population is highly diverse and socioeconomically disadvantaged. Many students attending the school need to supplement their family’s income through after-school work. To attract these students to the program, a basic stipend for their participation is offered. The lead teacher, a 20+ year veteran of high school biology teaching, runs the program that regularly meets from 5-7:30 pm, 2 days a week. He is assisted by CBST education staff on a weekly basis and conducts various hands-on activities and field-trips. Three undergraduate students from UC Davis also participate as student mentors starting in the second semester. The mentors act as role models and help student teams with their individual research projects. During the first year students (1) engage in inquiry-oriented activities; (2)are introduced to research and industry opportunities through field-study trips and interaction with CBST research scientists ; and (3) work in small research teams to design systematic investigations of a Biophotonics-related phenomenon. The year culminates with a research symposium and a publication of the students’ research reports. Students who successfully complete the first year will be offered an internship for a second year of study. studies during CBST-sponsored high-school summer research workshops. Students interested in continuing with the program for a second year may participate as Research Associates at the sponsoring school. 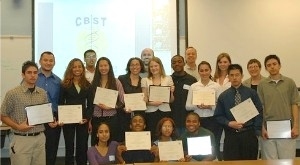 Depending on availability, internships may be offered to students who have participated in CBST research academy work. An outline of the topics/concepts and subtopics taught in the program. This is a handout for students that outlines procedures for designing an investigation. A typical lesson using biophotonics technologies to study aspects of human physiology. Please contact Mike Wright or Marco Molinaro for more information.